With Pentecost coming quickly upon us, it's a good time to revisit some past posts with ideas for bringing the spirit of Pentecost alive in our meal and dessert preparations. 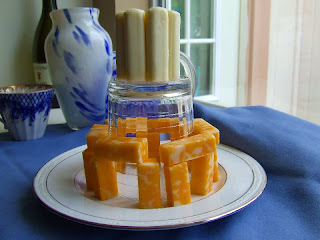 In addition to the awesome birthday cake idea (Happy Birthday Church!) 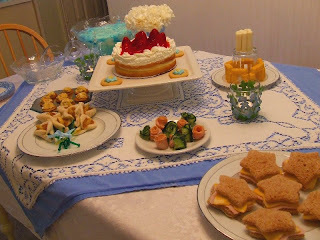 just shared by Robina there is A Cake for Pentecost from last year as well. Don't forget the Portuguese Holy Ghost Sopas shared by Amy or Evelyn Birge Vitz 's Twelve Fruit Salad from A Continual Feast. 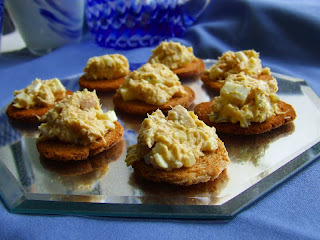 More ideas can be found in Jessica's Menu ideas for Pentecost Sunday and Pentecost suggestions are also mentioned in Jenn's two part series "Staples of Our Feastday Celebrations" - Wine and Bread. I always like to have a simple option on hand if time is tight on feast days. For us cupcakes are an easy dessert to pull together. Here is a simple Pentecost cupcake decorating idea with two variations for "flames." Using white frosted cupcakes add thin sliced strawberry "flames" to represent the tongues of fire. Or add some red and yellow food coloring to small amounts of extra frosting and dab on swirl frosting "flames." And check out Meredith's Sweetness and Light blog for her lovely strawberry topped cupcake variation from a few years ago. 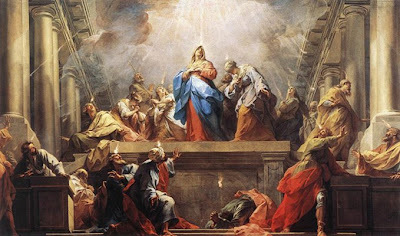 Pentecost celebrates the descent of the Holy Spirit onto the twelve apostles. Pentecost is celebrated seven weeks after Easter, this year on May 31st. This event marks the BIRTHday of the Church as with this power of the Holy Spirit the apostles went out to be Jesus' witnesses to the world, able to speak all language and perform great acts. "But you will receive power when the holy Spirit comes upon you, and you will be my witnesses in Jerusalem, throughout Judea and Samaria, and to the ends of the earth." What better way to celebrate a birthday than to have a birthday cake. 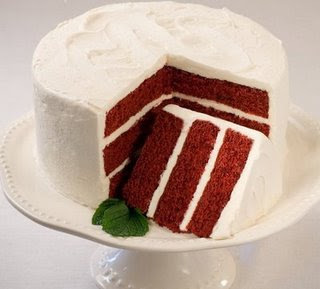 Since red is the liturgical color for Pentecost, I think a red velvet cake with cream cheese icing sounds perfect. Place twelve candles on the cake representing the twelve apostles, and the lighting of the candles represents the flame of the Holy Spirit descending upon them. And they were all filled with the holy Spirit"
There are so many variations of red and white cake and decorations possible, so make whatever cake combination you fancy. I am doing this for the first time this year so I don't have a picture of a red velvet cake with twelve candles on it yet. This picture is meant to sweeten your appetite to want to make this scrumptious treat to celebrate the Holy Spirit and the beginning of our Holy Mother Church. For more ideas for celebrating Pentecost, be sure to check the archives! Spearmint (Mentha viridis or Mentha spicata) was particularly dedicated to the Virgin Mary, and its common names include Our Lady’s Mint, Mary’s Mint, Mary’s Leaf, Lady’s Leaf. These names are very similar in other languages illustrating the universality of naming specific plants for Our Lady. In the various names for spearmint in other languages we can see an example of this universality - in French, Menthe Notre Dame and Herba Santa Maria in Spanish. Also, according to information I read on Ann Ball' s website, mint was one of the favorite strewing herbs in the Middle Ages; it was strewn on the floors of churches and banquet halls to furnish a pleasant odor. It was used by the monks in cooking and medicinally. Another Marian herb also in the mint family is lemon balm (Melissa officinalis) which was known in medieval Mary garden’s as Sweet Mary. Its lovely fragrance fills the air and could be a reminder to help us be aware of Mary's presence in our life. Lemon balm has a strong history in Catholic religious settings. It is the principal ingredient in Carmelite Water or “Eau de Melisse de Carmes” which was invented by Carmelite nuns and used both medicinally, and externally as a perfume or Eau de Toilette. Lemon balm is also an ingredient in the liquor, Benedictine, which was first made by Dom Bernardo Vincelli, a monk at the Benedictine Abbey of Fecamp in Normandy in the 16th century. As we enter the season of summer in the northern hemisphere, cool beverages are a great way to beat the heat and find refreshment. A couple sample iced drinks which use these herbs of Our Lady are shared here. Place 2 cups water, sugar and mint in a small saucepan, bring to a boil and simmer for 10 minutes. Strain and discard mint. Thinly slice about 1 cup of strawberries and set aside. Add 1/2 of the remaining strawberries to a blender and blend until smooth; pour into 2 quarter pitcher. Stir in sliced strawberries and remaining water. Cover and chill until serving. Flowers are symbolically linked to Mary in many ways - through their Marian names and the various legends. 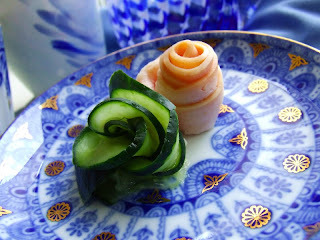 Edible flowers are a delightful garnish or adornment for cakes, desserts, salads to celebrate Our Lady during her Month of May, or at any feast day or tea time in her honor during the year. The life of a fresh flower is fleeting so their preservation by crystallizing with sugar will make them last much longer. As a decoration for an iced cake or a garnish for a dessert fresh, crystallized edible flowers bring color, fragrance and flavor to any recipe. Meredith, at Sweetness and Light, has posted about making candied violets for a Marian tea cake. 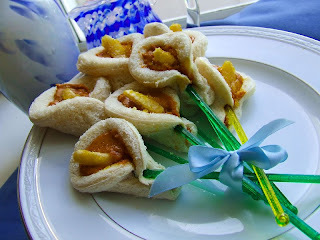 You can make your own candied flowers for your Marian treats. Use edible flowers for this project – and make sure they are ones that haven’t been treated with pesticides. The flowers in the Violas family (pansies, johnny jump ups and violets) are perfect for crystallizing. Other edible flowers that could be used include daisies, lavender, roses, calendulas, cornflowers, and blossoms from fruit trees--apple, peach, plum, orange and lemon. Choose fresh flowers. Cut flower, leaving approx. 1-2 inch stem to hold while sugaring. Gently wash the flowers under a gentle stream of water or in a small bowl with cool water. Place on paper towels and let dry completely before continuing. Remove pistils and stamens from flowers before sugaring. The egg white or meringue mixture is used to coat the petals and to adhere the sugar. We used a meringue mixture of 1 tablespoon water to 1 teaspoon meringue powder. Sprinkle powder on water and let sit for awhile before stirring to avoid the powder clumping. If using an egg white, whip until frothy before using. Apply a thin layer of egg white or meringue mixture on each side of each petal with a small paintbrush in a thin, even layer. Hold the flower over a bowl, sprinkle or shake super-fine sugar over the entire flower. Tap to remove excess sugar and repeat on reverse side. When coated, place on waxed or parchment paper to dry. Allow approximately 24 hours to dry and harden completely. Carefully place flowers on cake or other dessert to garnish. And since we are talking about herbs, let's look at another herb, one associated with a June saint, St. Anthony of Padua. We have just under a month to grow some pots of basil to help celebrate his feast day in a unique way. According to the Saint Anthony of Padua website, it is customary to decorate with pots of sweet basil (Ocimum basilicum) on that day and to give some away to friends with prayers invoking this Saint. Hopefully posting now gives you plenty of time to get some ready and embrace this tradition. We purchased some small terra cotta pots at the craft store and painted them to remind us of St. Anthony. His symbols include the lily, bread, Christ Child, book, fish. We used acrylic paints and Sharpie markers to decorate the basil pots. To help keep paints from fading or wearing away (especially if pots will be used outside), use 2 coats of a clear acrylic indoor/outdoor sealant such as Krylon spray to coat after painting. After filling them with potting soil we planted some Sweet Basil. Now we will tend the pots for the next several weeks and hopefully by June 13 have some decent basil plants to decorate our table and to give away to friends for their kitchens or patios. Keep a pot of basil nearby and you'll always have some of this fresh herb to add to your cooking. *Basil is sentivite to cold and is best grown in hot, dry conditions. *Basil will grow best outdoors, but can be grown inside placed in window with lots of sun. *Pinch off the growing tips to make the plants bushier. *Remove flower spikes to prolong your harvest. *Add a small amount of fertilizer every month or so. *Water at the base of the plant avoiding showering the leaves and stems. *Basil can also be propagated very reliably from cuttings. Thyme (Thymus vulgaris) is a delicate green, perennial herb with a faint clove aftertaste. It is often used herb in French cuisine. Leaves and sprigs are used in salads as garnishes, in clam chowder, and French, Creole, and Cajun cuisines. Thyme works well with veal, lamb, beef, poultry, fish, poultry stuffing, pâtés, sausages, stews, soups, stocks, bread, herbed butters, herbed mayonnaise, flavored vinegars, mustard, and bean and lentil casseroles and its flavor blends well with those of lemon, garlic, and basil. Thyme is indigenous to the Mediterranean area. It came to America with the first settlers. Recognizing the antiseptic properties of thyme, the Egyptians used it in the embalming process and the Ancient Greeks found it to be a good fumigant. There are many plants and herbs associated with the nativity. One legend has it that thyme was included among the hay used to make a bed for the Virgin Mary and the Christ Child, so it is often considered one of “Mary’s bedstraws” of which there are several. ~From Herbs and Herb Lore of Colonial America by the Colonial Dames of America. In Marian Garden literature, thyme is commonly referred to as The Virgin’s Humility. It is one of those cases where an attribute of the plant seemed to symbolize a virtue of the Blessed Mother. Am still looking for the specific explanations of connections of thyme to this virtue of Mary’s humility. Most likely is seems that as a plant that is a delicate creeping plant that lies low to the ground it would be symbolic of the lowly nature of humility. Mary’s Magnificat reflects most profoundly her deep humility of heart, open to divine grace. 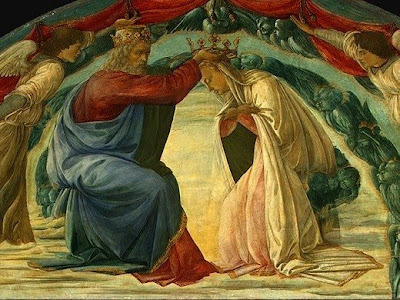 So as you use this herb in your kitchen's it can be a time to meditate on the Our Lady's humility, for as St. Bernard says, "Humility is the foundation and guardian of all virtues." Add fettuccine to boiling water and cook until tender but still firm, about 8 to 10 minutes. Drain pasta. Reserve 1/3 cup of the pasta cooking water. Combine the 1 cups Asiago cheese, creme fraiche, Parmesan, thyme, salt, pepper, cooked pasta, and pasta cooking liquid. Toss gently until all the ingredients are combined and the pasta is coated. Place in a buttered baking dish. 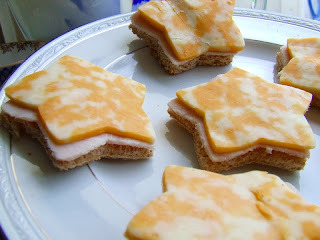 Sprinkle with 1/4 cup Asiago cheese. Bake about 25 minutes, until golden brown on top. Let sit for a few minutes before serving. Makes approx. 4 servings (recipe easily doubled). I meant to add some information about creme fraiche as I had never cooked with this before and know that it might be challening to find. Creme faraiche is a traditional soured cream commonly used in Europe. It's more diffiuclt to find in US except in specialty stores and is quite expensive, I guess. On-line I found many "recipes" for making a suitable variation to use in recipes which call for it. Basically you take a cup of heavy cream, heat on low until it is tepid, add a tablespoon of cultured buttermilk. Stir together and pour into a glass jar or bowl. Partially cover and let stand at room temperature for 8 to 24 hours, or until thickened. It keeps for about 2 weeks in the refrigerator. for the feast of Our Lady of Fatima! In Meredith's new book, Mondays With Mary (which is wonderful by the way!! ), she shares a "Dancing Sun Craft" for the feast of Our Lady of Fatima. This reminded me of the Sun Cupcakes we recently made for one of our Garden of the Good Shepherd activities. I thought they would be perfect to celebrate this feast as well. So while my children watch The Day the Sun Danced: The True Story Of Fatima this afternoon, and color this picture, I think I might just whip up another batch! Rosemary (Rosmarinus officinalis) is a hardy perennial herb and a member of the mint family. It has lovely smelling, thin evergreen leaves and light blue flowers. The flavor and aroma have a character similar to pine. This pungent taste lends itself easily to meats, potatoes and breads and it is a common ingredient in marinades and soups. Rosemary combines well with other herbs but has a tendency to dominate. You can use full sprigs for a nice garnish. To use sprigs of fresh rosemary in cooking, strip the leaves from the main branch by holding the tip and pulling down on the leaves in the opposite direction they are growing. Chop the leaves before adding to a recipe. It can also be used dried. Cut chicken breast in fillets. Season lightly with sea salt and place in a shallow, glass dish. Whisk together vinegar, olive oil, lemon juice, garlic, and rosemary; pour over fillets. Cover and refrigerate at least 30 minutes. Remove chicken from marinade. Cook on preheated grill. For a variation of the recipe, salmon fillets or thin pork loin chops could be substituted for the chicken - both are good with rosemary. Since early days of Christianity and particularly during the Middle Ages, plants and flowers have been named and dedicated to Our Lady. As a way to honor Mary, people saw reminders of Mary in their daily lives and found special significance and symbolism in various flowers and herbs they associated with her. In addition to the numerous flowers, there are many herbs connected to Mary. Some have lovely legends associated with them – some just the name given for an attribute or characteristic of the plant that was associated with Mary. Other plants were dedicated to Mary because they may have been connected to some event in her life or flowered around the time of one of her feast days. Herbs are traditionally blessed on one of Mary's feast days - the Assumption. Vincenzina Krymow, in the book, Mary's Flowers states, "Early Christians believed that fragrant herbs and flowers reflected May's spiritual sweetness, soothing and healing herbs reflected her heavenly mercy, while bitter and sour herbs mirrored her bitter sorrows. " Those herbs whether sweet, savory, bitter, or healing - with their unique flavors and aromas - can add a spiritual dimension to our Catholic kitchens. Cooking with the herbs associated with Our Lady provides an opportunity to reflect on her nature and experiences. One idea is to bring Our Blessed Mother into the kitchen with a mini Mary garden - small potted herbs with a Marian statue. Fresh herbs that honor her will always be available to you for cooking. Early in the month of May it is tradition to have a May Crowning to honor Mary, the Blessed Virgin Mother, as the month of May is dedicated to her. This is often done as a procession with a ceremony of placing a crown of flowers onto a statue of Mary and flowers at the foot of the statue. Hymns honoring Mary are sung and prayers such as the Haily Mary, Hail Holy Queen, and Memorare are said. For more information on how to have a May Crowning in your home and the history of May Crownings go here and here. 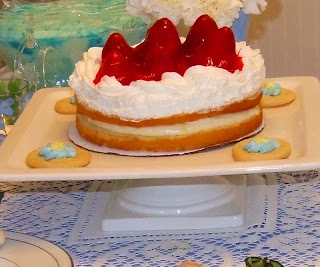 To celebrate this event with food I came up with this yummy idea of making an edible replica of the floral crown for Mary with Rice Krispies using this recipe. Decorate it however you like with blue and white icing flowers, sprinkles, jellybeans in the shape of flowers. The possibilities are endless. 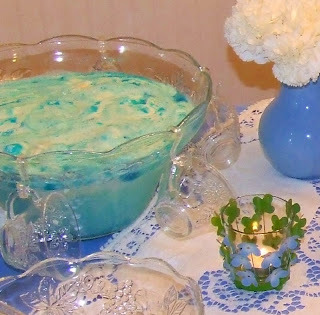 I used blue food coloring to symbolize the blue in Mary's mantle but you could keep it the basic color too. Inside the crown you can display your Mary Candle. frosting, sprinkles, jelly beans etc. 1. In large saucepan melt butter over low heat. Add marshmallows & stir until completely melted. Remove from heat. Stir in food coloring. 3. Transfer cereal mixture to wax paper. Using buttered hands shape mixture into wreath approximately 8 inches in diameter. Decorate with frosting, sprinkles, candies, powdered sugar. Best if served the same day. Note: This picture above is only a half recipe because someone got a hold of the marshmallows and ate half the bag. Also, I had planned on using the blue and white jelly beans left over from Easter as the center of the flowers, but they got eaten too before I could use them. So I made a buttercream frosting with butter, powdered sugar and vanilla extract. I use a simple ziploc bag for piping the frosting out. I am not a very good frosting decorator but I think you can tell that the crown is decorated with flowers.